Sarah was an inexperienced climber. 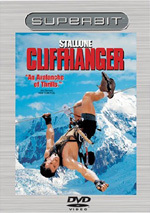 She trusted Gabe to rescue her, but something went wrong high above the valley floor ... Sylvester Stallone, John Lithgow, Michael Rooker, Janine Turner and Ralph Waite star in this high-altitude avalanche of action - a non-stop adventure packed with suspense and capped with heart-quaking terror. For Rocky Mountain Rescue, the mission is almost routine - locate five climbers. With the woman he loves (Turner) and his best friend (Rooker), Gabe Walker (Stallone) braves the icy peaks only to discover that the distress call is really a trap - set by merciless international terrorist Eric Qualen (Lithgow). Now millions of dollars and their own lives hang in the balance. Against explosive firepower, bitter cold and dizzying heights, Walker must outwit Qualen in a deadly game of hide-and-seek. How Renny Harlin ever became a hotshot movie director remains beyond me. I love good action films but I consistently find his works to be generally crass, crude, and executed with little style or flair. A glimpse through his catalog reflects a filmmaker who occasionally creates some decent movies. Both Die Hard 2 and The Long Kiss Goodnight are moderately good, and A Nightmare On Elm Street 4: The Dream Master has its moments. In general, however, his pictures seem lifeless and flat, with little to differentiate his work from any other big-budget action flicks. 1993's Cliffhanger perfectly encapsulates the Harlin method. Virtually every one of his movies seems like it should be incredibly exciting and captivating, and Cliffhanger is no exception. It offered a unique scenario, with its "Die Hard in the Rockies" setup, and it looked like a potentially thrilling setting. Okay, I'm not claiming the Die Hard bent sets Cliffhanger apart, but the mountain backdrop created a variety of possibilities that should have added real flavor to the film. Little of that appears in the final product. As it stands, Cliffhanger seems like a competently made film but it lacks spark or pizzazz. Some of the action sequences look as though they should be thrilling, but for undefined reasons, they're not. For me, the phrase of the day is "flat". Almost everything about Cliffhanger seems bland and stiff. It's exactly the kind of action movie that the genre's opponents think of when they disparage them - dumb, awkward and gratuitously violent. Unlike many people, I've never been on either side of the fence in regard to Sylvester Stallone. I don't particularly like his work, but I don't have any genuinely negative feelings about him. I like action films, so I probably should have been a fan, but unlike Schwarzenegger, Stallone has never made anything of note in that genre. None of his action flicks has ever done much for me. I looked forward to Cliffhanger back in 1993 since I'd liked Die Hard 2 and I thought perhaps Harlin could finally force Stallone to make a truly positive piece of work. Unfortunately, that didn't happen. Cliffhanger seemed pretty lame when I saw it theatrically, and time has not been kind to it. The movie appears no worse now than then, but it hasn't improved with age. It's still a weak excuse for an action piece. Despite the presence of a decent cast - with real actors like John Lithgow and Michael Rooker on hand - every character seems bland and forgettable. Lithgow seems especially poor as the least-intimidating baddie on record. Perhaps it was his use of a very phony British accent, but for whatever reason, I thought Lithgow offered no personality and presence in the role. Rooker looks nicely intense at times, but he seems equally forgettable. As for Sly himself... Stallone is Stallone. The guy appears to have some talent, but he hides it under masses of muscles and prefers to let his pecs do the work. Perversely, I often root for Stallone to appear in a real movie, and while he came close with Copland, he never seems able to overcome his own lunkheadedness. His portrayal of hero Gabe Walker is so light that it's amazing it stuck to the film. I don't hate Cliffhanger because it's just too bland to inspire strong emotion. I didn't enjoy it but I was bored more than anything else. Even with all the action, none of it seems thrilling or scary or exciting. If there's anything less interesting than a dull action movie, I have yet to find it. 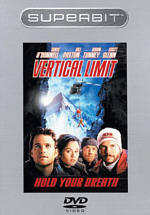 Cliffhanger appears in an aspect ratio of approximately 2.35:1 on this single-sided, double-layered DVD; the widescreen image has been enhanced for 16X9 televisions. Although the picture displayed some problems, it generally looked pretty good. Sharpness seemed mostly positive. Mild softness crept into the image at times, but those instances were rare and minor. Most of the time, the picture appeared clear and crisp. No real instances of moiré effects and jagged edges appeared, but some moderate edge enhancement popped up at times. The print seemed slightly gritty at times, with periodic instances of speckles and marks, but it generally looked clean. Colors appeared natural and bright, with no evidence of bleeding or noise. The film stuck to a realistic appearance for hues and they seemed clear and clean. Black levels looked fairly deep and dark, and shadow detail generally was good. Some scenes made Leon overly difficult to see, however. Still, as an overall package, the image of Cliffhanger looked fine, with only a smattering of issues to bring my grade down to a “B”. Virtually no problems affected the excellent audio of Cliffhanger. This Superbit release included both Dolby Digital 5.1 and DTS 5.1 soundtracks. I discerned no differences between the pair other than slightly louder mastering for the DTS mix. Otherwise, the pair sounded identical to me. The mixes provided tremendously broad and involving soundfields. At virtually all times, discrete audio engulfed the viewer and makes the experience much more exciting than it otherwise would be. The sound designers really had a field day with this one, as they integrated the sounds well. Everything seemed appropriately placed and the entire mix blended together smoothly. It's a simply fantastic example of audio design, with active surrounds that contributed a lot to the presentation. The quality of the sound seemed equally strong. Although much of it clearly must have been dubbed, dialogue appeared warm and natural, with no edginess or problems with intelligibility. Music was bold and strong and it displayed excellent dynamic range. The effects were the real stars of the show, however, as one might expect. All of the sounds came across as clean and realistic, with virtually no distortion. The track packed a serious punch and bass response seemed excellent. Cliffhanger presented an audio experience that any listener should find very satisfying. How did the picture and audio of this DVD compare to the special edition from 2000? I thought both seemed identical. Audio was the same, and I noticed no substantial differences in regard to picture. In the latter category, the problem fell into the “sow’s ear” category. Most of my complaints about the original stemmed from edge enhancement and source flaws, and both continued to exist on the Superbit version. Too many Superbit DVDs toss out the same flawed transfers found on the prior releases. Without cleaned-up visuals, the Superbit discs can’t be much superior to their predecessors. And that’s why I continue to recommend the special edition of Cliffhanger over the Superbit release. The latter doesn’t seem to improve upon the former’s picture and audio. The Superbit also costs $12 more and loses a fine roster of extras. Stick with the special edition instead of the Superbit disc.